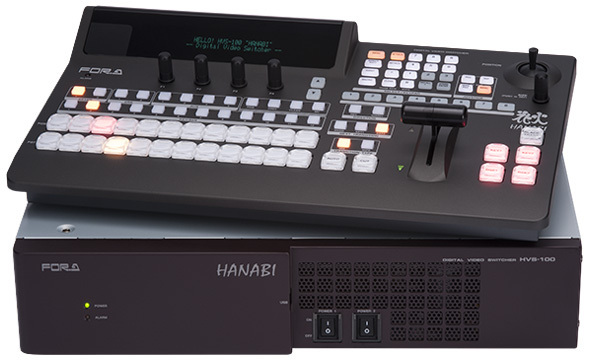 The newest additions to FOR-A’s Hanabi series of portable video switchers, the HVS-100 and HVS-110 boast exceptional cost performance. Both mixers inherit and improve upon the diverse functions and features of the popular HVS-300HS, including mixed HD/SD input, frame synchronizing, re-sizing engine, 2.5D wipe effects, DVE, Chroma keyer and DSK. The HVS-100 and HVS-110 also have a built-in Web server that lets you change settings from a PC or a tablet. A clip memory feature has been added to the still store to support playback of video or animations and enhances productions through the use of CG wipes, while the multi-viewer meets a diverse range of monitoring needs. The equipment can be used in all types of locations, including live events, sports, news studios, OB vans, editorial offices and presentation venues, making it the ideal tool for shaping the imaginative ideas of video creators. HVS-100/110 have many new functions! External keyer control over DSK-400. HVS-100PCO option supports 1080/29.97p, 25p, 24p, 23.98p. PC-resolution output also supported at 1080/59.94p and 50p. To update your HVS-100/110 unit with the latest features, contact your FOR-A sales representative. The HVS-100/110 come in two models: one with separate main unit and control panel, and one with compact, integrated design, both of which can be adapted to a wide variety of applications and operation configurations. The control panel has been laid out specifically with professionals in mind with a design that leverages the knowledge of expert operators. 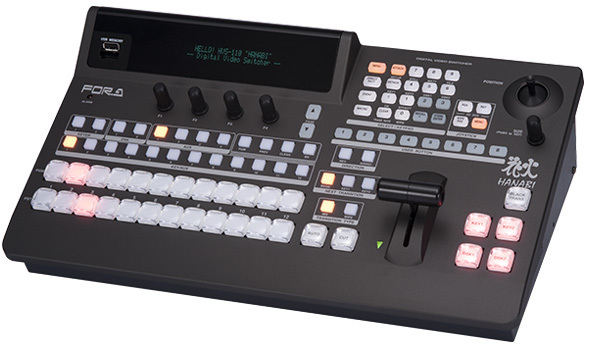 It includes dedicated bus buttons, AUX buttons, a fader controller and direct user buttons for various functions. The main unit offers exceptional expandability to facilitate the addition of a redundant power source unit and various input/output cards. Featuring operability almost on par with the HVS-100, the HVS-110 also boasts a compact design enabling simple portability. The inclusion of ample video input and output functionality makes it ideal for use in small broadcasting vans and broadcasting helicopters. Despite being portable, a redundant power source is also possible using an optional AC adaptor. 1Compact, multi-functional, and very affordable. Unbelievable cost performance! The compact HVS-100/110 come equipped with multiple, unique functions, never before seen in smaller switchers, offered at the lowest prices ever. Compact, multi-functional units at very affordable prices, all with enhanced performance…. what’s more, the units can be used in all types of locations, including news studios, OB vans, at live events, educational institutions, and for presentations. The HVS-100/110 are perfect for putting your idea into practice. With frame synchronizers on all inputs (HVS-100), you don’t need to provide genlock for any input devices. What’s more, it is easy to add video signals from sources that do not have the ability to genlock like computers or low end cameras. The Frame sync also allow for full proc amp control on any input. For situations where inputs can be genlocked, the frame sync function can be turned off on any individual input. 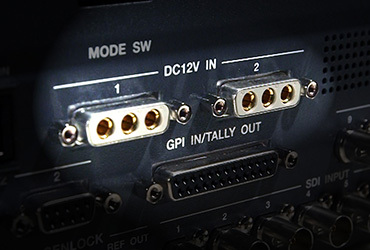 Frame synchronizers and proc amp on all inputs simplify your system. The HVS-100/110 can be controlled by tablet, Smartphone, and PC via web browser. 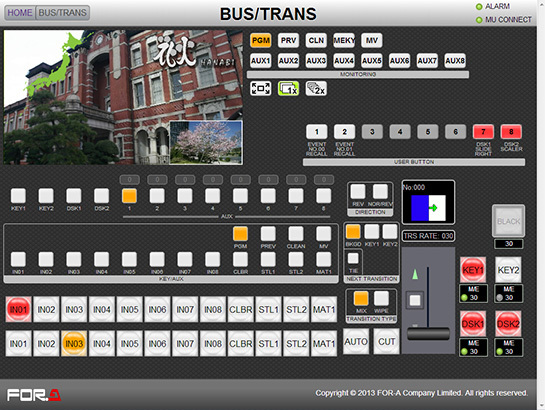 The GUI screen is based on our easy to-use control panel. 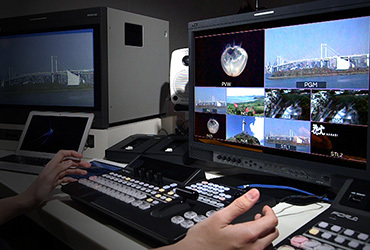 What’s more, the switcher can stream any of its output video to the web interface. Up to three types of control can be used simultaneously: Control panel, web interface or any number of aux remotes. 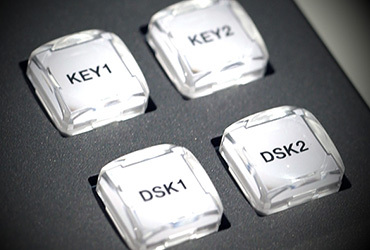 2 keyers and 2 DSKs are equipped with dedicated 2.5D DVE. Resize position and effects can be assigned separately for each Keyer. We also provide an assignable chroma key based on FOR-A’s industry leading chroma key technology. FOR-A’s many years of Virtual Studio engineering knowledge allow us to provide a chroma key that rivals the best standalone units on the market. No need for extra chroma keyers in CG creation. 52 Still Stores with video playback. The HVS-100/110 support 2 channels of still store function and each still store can record video files up to 227 frames in length. Still images or video can be captured from any input, imported from USB Memory or through a LAN cable connection. The video function is perfect for logos, animations or CG Wipes. CG wipes can be created easily in the dedicated menu section. In addition, any unused input can be an additional still store using the frame sync function. The FOR-A HANABI series of video switchers are the first to come equipped with a multi viewer, now an essential function for video switchers. The HVS-100/110 are capable of 2/4/5/7/9/11/16 split multi viewer. Input/ Output sources can be displayed freely with title, tally, and audio level. Multiple AUX outputs can be used more than just for monitoring. The HVS-100 and HVS-110 provide the ability to assign DSK to AUX outputs for keying and dissolve or cut between sources. One small switcher can provide all the different outputs for a large live staging event or a broadcast with multiple on-set displays. The HVS-100/110 are capable of memorizing up to 100 events including parameters, key, and DVE functions. Any memory can be re-called from the memory section or assigned to a user button for quick recall. Parameters are automatically interpolated while an event is recalled to provide a smooth transition. In addition to the event memory, a variety of system memories allow for the full switcher set-up to be recalled. This function is perfect for recalling operators preferred settings or switching between different productions. 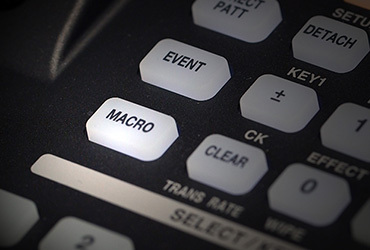 The powerful macro function allows a series of operations on the control panel to be memorized in real-time. 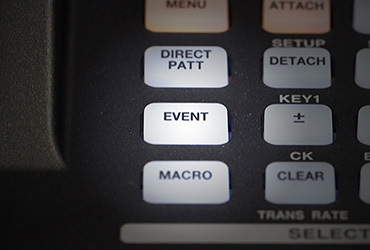 This means a complex series of keys and transitions can be rehearsed, and then learned by the switcher as a Macro. After that a one button trigger can perform the macro. The HVS-100 and HVS-110 are probably the least expensive switchers ever to offer a Macro function. Fault tolerance is an important factor in choosing your switcher, no matter how small the switcher is. We only employ consumables such as power units and cooling fans that meet our strict quality control standards. FOR-A uses the highest quality power supplies, but having an option for redundancy provides peace of mind. The HVS-100 has 3 slots to expand the number of inputs or outputs. In addition to 8 HD-SDI inputs, 4 HD-SDI outputs and 1 HDMI output (standard), various inputs or outputs can be added including HD/SD-SDI, analog composite/ component or, RGB/ HDMI. These option cards can be used to customize your switcher or provide for future expansion. Systems supporting 3Gbps 1080/59.94p or 50p are becoming a viable option to consider as we head towards a higher-resolution 4K era. 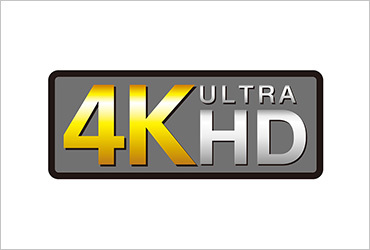 The HVS-100 and HVS-110 have been designed to offer future upgrades to 3G (1080P) and even 4K operation. Buy your switcher for today, but be ready for the future. Need a quote? Online configuration guide is available. 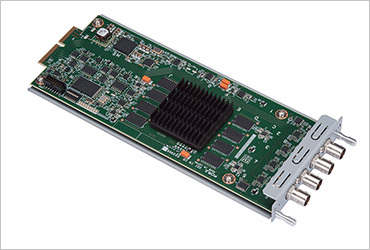 Thunderbolt™ 2 I/O expansion card for HVS-100/HVS-2000 switchers. The HVS-390HS video switcher will come in sizes from 1 M/E to 2 M/E. With its lightweight, compact design, the VTW-350HS is an extremely portable HD/SD character generator, perfect for live applications. Compact (1U) multi viewer for monitoring, featuring up to 16 inputs and 6 outputs. 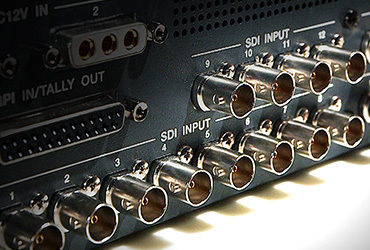 Multi-format routing switchers that support 3G-SDI, HD-SDI, SD-SDI, ASI, and AES signals.